I was surprised to see that there was no french translation. I am from Quebec (french-canadian), and I'm pretty much bilingual. I can't wait to help with the project, and i'll begin as soon as I can. Apparently, I spoke too soon. There already was a fully translated french version. I'll look into suggestions on what else I can help with. You can always check if there are any errors in the current one, sometimes even professional translators make mistakes. From what I've seen of it, it appears to be a hasty translation at best. Seems too close from the original english source text. Almost like a word-by-word translation. So here is version v0.2 of my french translation. Just rename it back to French.lng if you want to test it out. Alright, here is v0.3 of my French translation. Now here is v0.4 of my French translation. Damn you work fast. Be careful when updating strings though, so they still fit and don't exceed the UI space (eg. when replacing "alien" with "extraterrestrial"), I'll be revising this later and let you know of any UI issues I come across. Thank you, SupSuper . I've actually mostly been working on the menu text, since a lot of the original translation didn't fit all that well. Most of the work I have left to do is in the OVNIpédie entries. I've only done the crafts and their armaments thus far. Here comes v0.45 of my French translation. 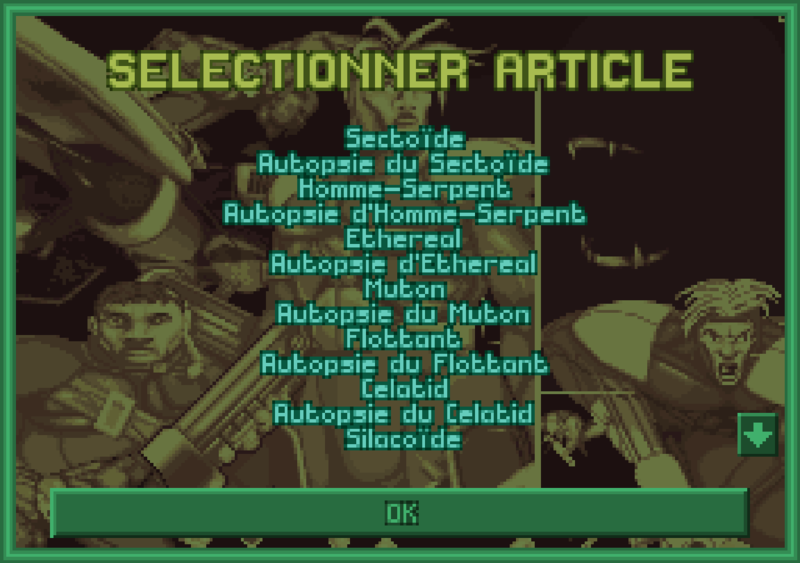 Anyway, here is v0.46 of my French translation. I've finished about half of the alien info/autopsie pages, along with the new terrain strings.